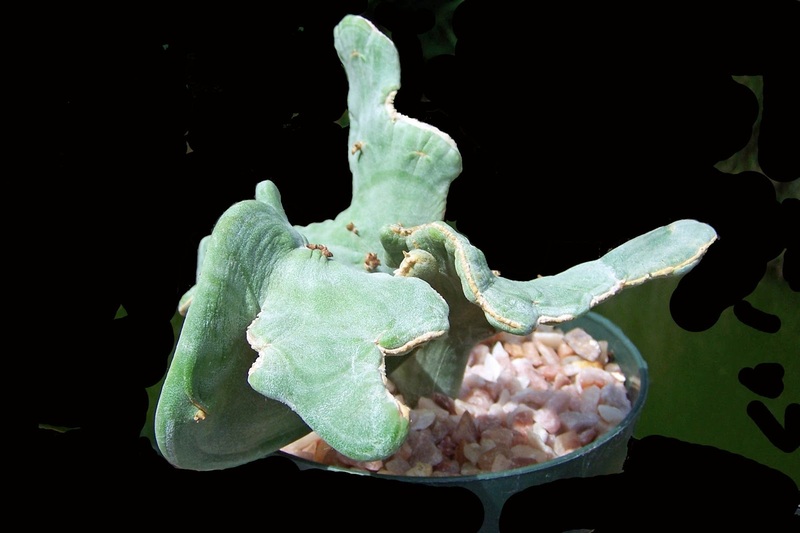 The person who originally grafted this crest labeled it Cleistocactus wendlandiorum var. aureispinus. C. wendlandiorum has been reclassified as C. brookei (which is white-spined) but I have no idea what happened to the variety name - if it ever was legitimate. If you're into naming, feel free to help me out here. But whatever the name, it's a beauty. 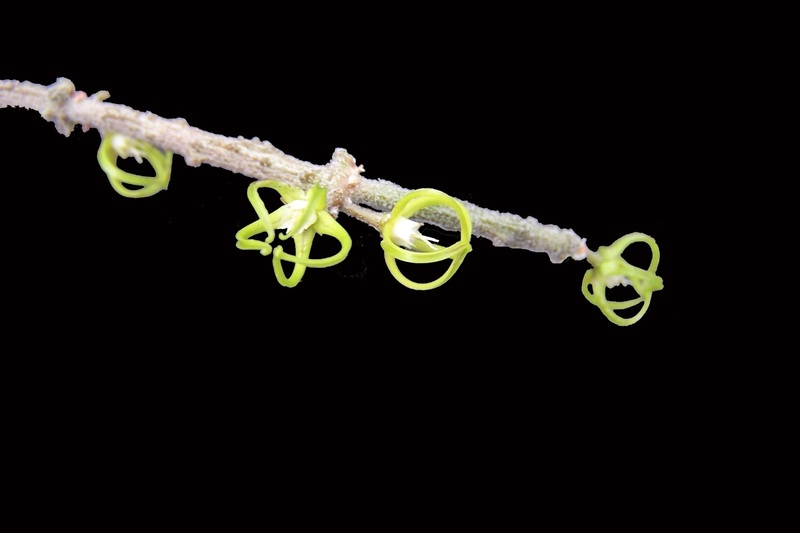 It's time for the weird plants to flower, and you can't get much more weird than this plant. We call it "Twiggy". We've grown these for years and the flowers never cease to amaze me. When we first got our starter plant for this it was much, much darker. But we're here in Oregon and we don't get the sun they get farther south and it's harder to get the really dark colors. But, who's complaining. Really. It may not be as "ebonyish" is it will be with more sun, but the colors here are just as outstanding. Our company from Wisconsin arrived today and I'm not sure when I'll have the time to go out and take more pictures. There are some wonderful and odd little flowers out there and I need to get out with the tripod and closeup lens. I'll try...but no guarantees! What more could you ask? It's relatively small in growth, has beautiful coloration and fascinatingly long and curly threads. In addition, like most agaves, it's quite easy to grow, even as a potted specimen in areas where it can't be grown outdoors year 'round. Can you guess? It's one of my favorites. Ornithogalum caudatum - "Pregnant Onion"
This is one of those plants which has just been in every collection since the dawn of succulent plant collections. And there's no reason for it not to be in our collections today as well. It's easy to grow and multiplies with ease (each little bulbil which develops under the "skin" eventually becomes a new plant). We first grew this under this name and it's hard for some of us to change. Other names you'll see is Ornithogalum longibracteatum and Albuca bracteata. I apologize for not posting for the last few days. It's been a bit hectic. Tomorrow we'll be heading to Salem (the state capitol of Oregon) with our granddaughter to attend the Oregon State Fair. This is pretty much a tradition in our family; we go every year. I'll try to get back to posting pictures by this weekend. One of our all time favorites. But of course, it's the all time favorite of a lot of people. Which also means that if you find somewhere that lists it as available, by the time you order it's out of stock. Life's that way sometimes! Lynn-Marie couldn't resist. Just wait until I get my hands on the camera! But other than that last shot, you can get an impression of our little 3rd of an acre in the city. Another of our crests that we're selling on ebay beginning tomorrow. It's kind of like a contemporary sculpture - only better! With the common name "Copiapoa de Carrizal" and a flurry of synonyms (Echinocactus malletianus, Copiapoa carrizalensis, Copiapoa dealbata), this is another wonderful copiapoa from the Atacama Desert in Chile. The photo, which was taken just a couple of weeks ago, is of a small plant in a 4" diameter pot. The flowers are yellow (the remains of one is at the top) and the new spines are black. This plant is in a 4" pot. Not a huge specimen by any means. But that's one of the things I like about copiapoas; they can be quite impressive even at a young age. Plus, they're really quite easy to grow. And look, it's even flowering! 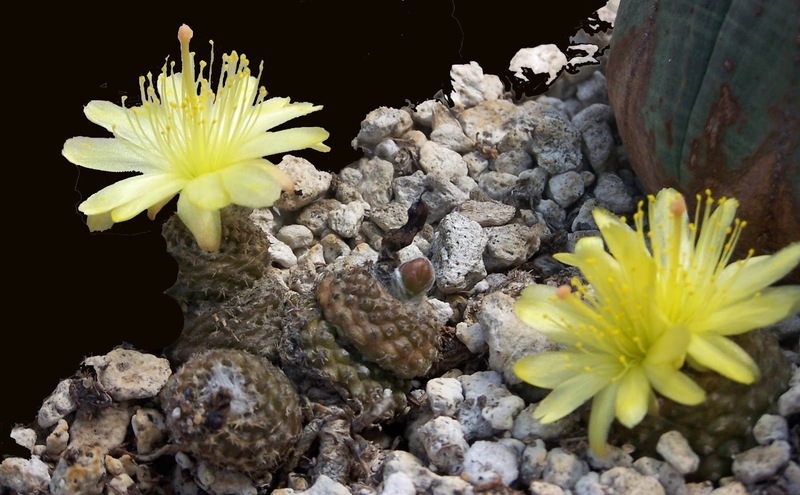 OK, yes it's flowering, but the great thing about this plant is the caudex that is forming under the soil level. And - of course - it would do even better if we could remember to water it! Consider this an open invitation to anyone in Portland and the Northwest to come to our home and nursery for an evening of food, plants and conversation this coming Sunday, August 18 beginning at 3 pm. The fried chicken and cold, non-alcoholic beverages will be provided by the club and the rest of the picnic will be potluck. Plants will be available to purchase beginning at noon. Also, on the day before, Saturday, August 17, we will be open for plant sales from 9 am to 5 pm. Come by to check out the plants on Saturday if you can't come on Sunday. This variety is small growing and doesn't offset readily but does so over time in cultivation. 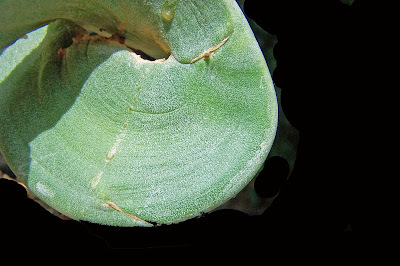 In addition, it comes from a very small plot in South Africa. In the heat of late summer, it should get a bit of a rest, but at least in our conditions it seems quite tolerant of our haphazard watering schedule. We've never had the species name on this plant. It came without a tag and we haven't ever had the time (or drive) to do the research to determine the species. We're pretty sure, but we don't put a species name on a tag until we're more than "pretty sure". In the meantime we just enjoy the flowers it produces every year. This has grown quite a bit since we first got it. It was just a little twig back then. I love those little succulent leaves and, as a plus, it's currently flowering. And now the caudex is getting more and more impressive. It makes a wonderful succulent bonsai-like centerpiece. This is an old clump which we had for several years. It's quite easy to grow with a gritty substrate with excellent drainage being most important. It's a summer grower. This is a seven year old plant grown from field collected seed. Quite rare in collections, its appearance is quite distinctive. I know I posted these in April, but I took a couple of new pictures and decided to go ahead and share them. I guess it's OK to repeat once in a while, especially if they're wonderful plants like these. This first one is grown from seed collected East of the type locality at GM447. The second photo is grown from seed collected at GM452, from west of Albertinia. 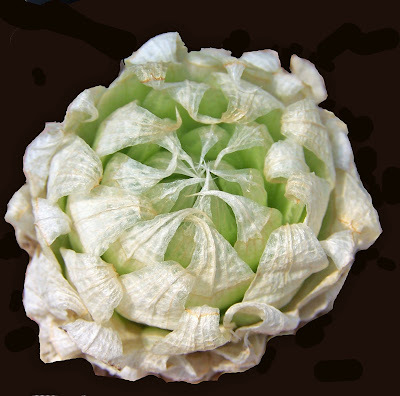 Currently in its dormancy, this was grown from seed collected at the Flomskraal Dam in South Africa. 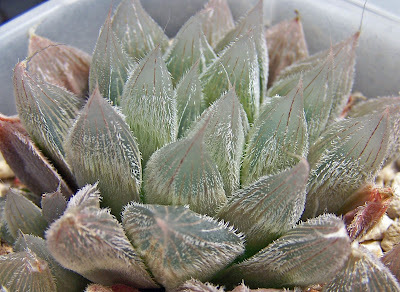 One of the most fascinating of the Haworthia genus, this is a real jewel, if - indeed - a jewel in the rough! This is one of those plants which is a show stopper whether it's in flower or not. From northern Argentina, it produces deep orange flowers around the base of the plant, and it responds well to an extra amount of pumice or equivalent in the potting mix. The variety designation probably isn't valid, but this is grown from seed so designated. Ariocarpus furfuraceous (Watson) H.C. Thompson, was properly published, but this is now generally subsumed into Ariocarpus retusus, as for example by Hunt in 2006. Regardless, they need excellent drainage and a dry, cool rest period.